Tipton County Paws and Claws: Spay and Neuter the Trailer Park Gang! Spay and Neuter the Trailer Park Gang! Prior to the formation of Paws & Claws and the fantastic Facebook family of animal lovers we have behind us, there was no help available for low-income residents in Tipton County who desired to have their pets sterilized, but simply could not afford to do so. We love rescuing animals from the shelter and seeing their transformations to loved family members, but in the bigger picture, these spay/neuter initiatives are even more important. This is the ONLY way that we can make a difference in the pet overpopulation problem and corresponding euthanasia rate at the Tipton shelter. Every single animal that we are able to help get altered will start to make a difference. 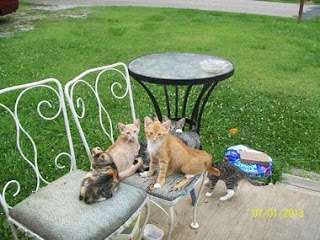 We have been asked for help by a kind woman who lives in a trailer in Tipton County who began feeding a few stray cats. Well now the few stray cats have turned into 18+ stray cats and there is another female due to give birth anytime. We MUST stop this cycle of reproduction. She loves these cats and will be happy to keep feeding them, but they need to be altered. We helped her get 2 females spayed last week and we have open spots for cats at the spay/neuter clinic tomorrow. We can take as many of her cats as we can raise money for! So PLEASE consider a donation to help us with this critical initiative! For every $60 donated, we can alter one of these cats.